PARK(ing) Day is a global event where citizens, artists and activists come together to transform the everyday metered parking space into a “PARK(ing)” space – a temporary public place. The event began in 2005 when Rebar (a local San Francisco art and design studio) decided to make an inventive yet powerful statement to public officials regarding the lack of public use places in urban areas. Rather than taking to the streets with picket signs and megaphones, Rebar opted to make the most of their inner city metered parking “lease” by transforming the space into a public park. Lush, green sod was spread across the urban area parking space accompanied by a bench and several other traditional park elements. Once the meter ran out the sod was rolled up and the parking space returned to its original under-utilized state. Citizens took notice of the studio’s peaceful protest and today this annual event is celebrated around the world. PARK(ing) Day takes place on the third Friday in September and has evolved to host a plethora of exciting spaces including everything from temporary health clinics to hair salons, bicycle repair shops and even wedding ceremonies. 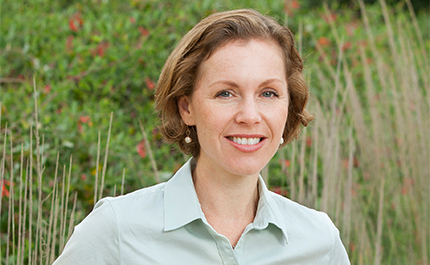 When the third Friday rolled around this September, the creative possibilities and the opportunity to engage the community was all too enticing for RVi Houston to pass up. (Celebrating a day outside in the sunshine away from the office wasn’t half bad either). Organized by the Rice Design Alliance, RVi participated alongside 16 other teams to transform the streets of Capitol and Travis in downtown Houston. 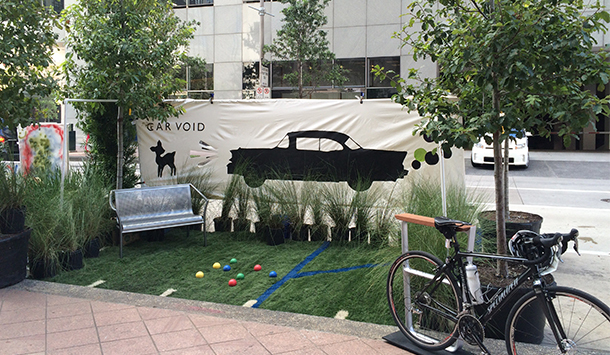 RVi’s theme was “A-void the Car” which focused on celebrating the variety of alternate uses for a car-sized space in downtown Houston, including RVi’s bocce ball court! Armed with breathtaking Mexican oak trees and muhly grasses donated by Moss Landscaping, a bench and parking stall from Landscape Forms, and yes, a bocce ball set, RVi went to work transforming their metered parking space into a fun and desirable destination. Houstonians flooded the streets to check out the “parklets,” asking questions, playing games, sitting in the shade, and most importantly gaining awareness of a great cause. While the notoriously over-trafficked city may not be keen on the idea of eliminating parking spaces just yet, RVi enjoyed working alongside neighbors and designers alike to bring a temporary artistic flare to the streets of downtown Houston. Click Here to see photos of RVi Houston’s transformed space and many others. I had no idea something like this existed, but what a unique idea! Thanks for sharing Jarka!